This old-fashioned way of potting fish preserves it in flavored butter. The traditional way is to clarify the butter, giving you a lovely rich, clear yellow seal, but you need twice as much butter. Carefully flake the smoked fish into small pieces, removing any bones as you go. Place in a bowl with the dill, parsley, horseradish and lemon juice. Season with salt and pepper to taste. To clarify the butter, melt pound of butter in a saucepan over a low heat without stirring then leave to settle so the milk solids fall to the bottom. Spoon the liquid butter off the solids and strain through a sieve lined with a damp muslin cloth. Discard the solids. 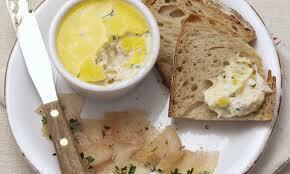 Combine three-quarters of the melted or clarified butter with the fish and mix well. Pack into ramekins, bowls or jars (totaling about 3 cups) and pack down tightly with a fork. Pour the remaining butter over the top and refrigerate. Bring to room temperature for at least 30 minutes before serving. Serve on toast with bread and butter pickle (recipe follows). Keeps for a week in the refrigerator. Halve the cucumber lengthwise and scoop out the seeds. Slice very thinly, using a mandoline if you have one. Place in a colander along with the onion and combine with the salt. Leave for 30 minutes then rinse thoroughly. Meanwhile, place the vinegar, sugar, turmeric, celery seeds and mustard seeds in a saucepan, bring to the boil then cool. Mix with the drained cucumber and onion, and the dill. Keeps for 2 weeks in the refrigerator.